I am nothing if not a woman of my word. Am I right? 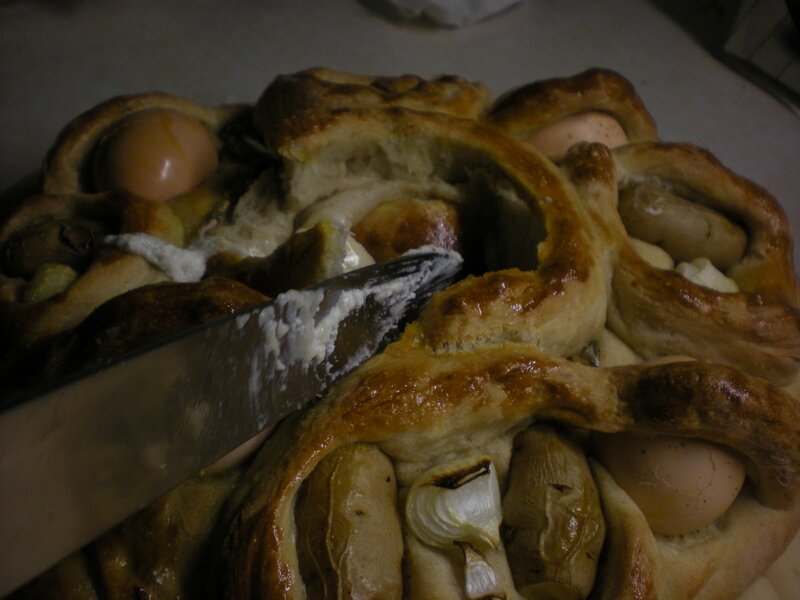 I have been coveting this bread ever since I saw it on Brown Interior’s blog. I just had to make it. I promised you I would make it. So here I am. 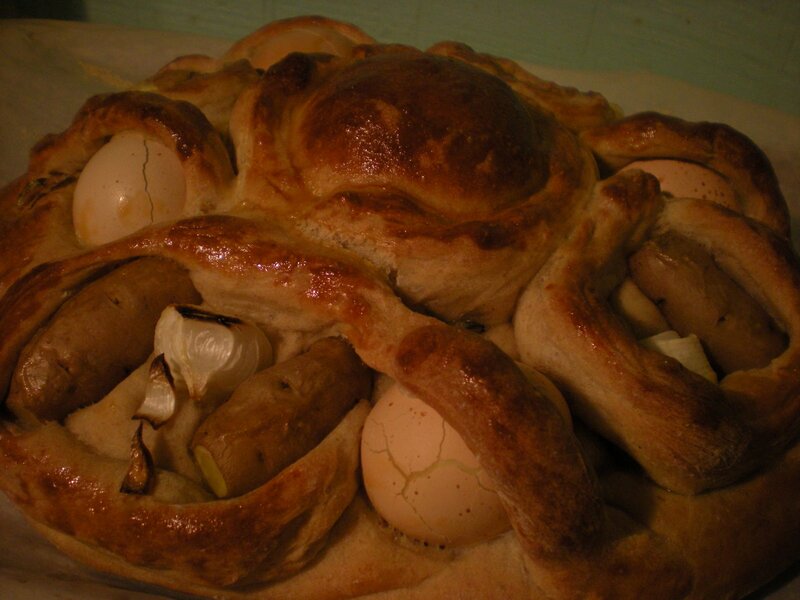 The recipe is fairly simple and took about 5 hours to make from start to finish. While it made dinner last night a late one, it was tasty. Mr. Bread Maiden is already thinking about variations. Wild yeast starter is the base for most of my breads, but 1) I didn’t have any at the moment, and 2) I wanted the bread NOW. Well, 5 hours from now, not 25 hours from now. Here are my variations on the recipe: I used commercial starter, and mixed in some spelt, all-purpose, and whole-wheat flour into the bread flour, and I included potatoes on top. Mix together the sponge ingredients and let this sit for an hour. 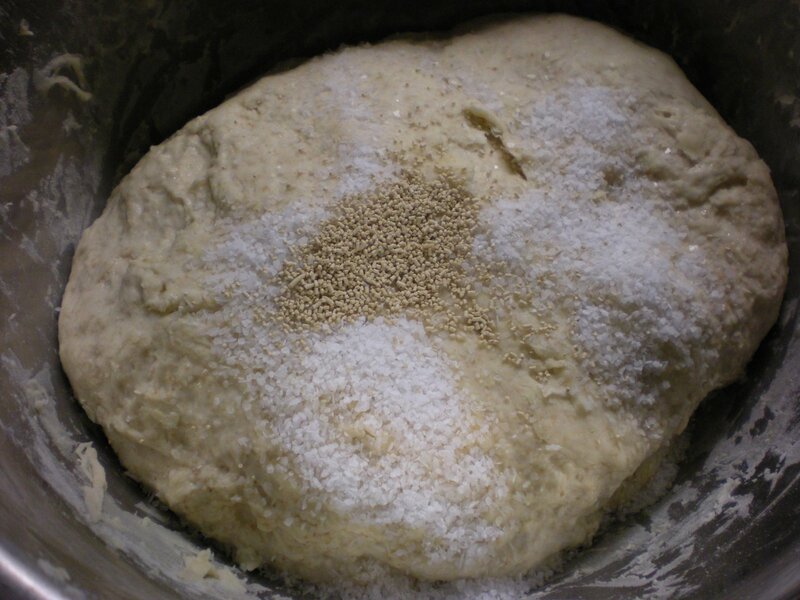 Add the flour and water from the Final Dough and knead for about five minutes. 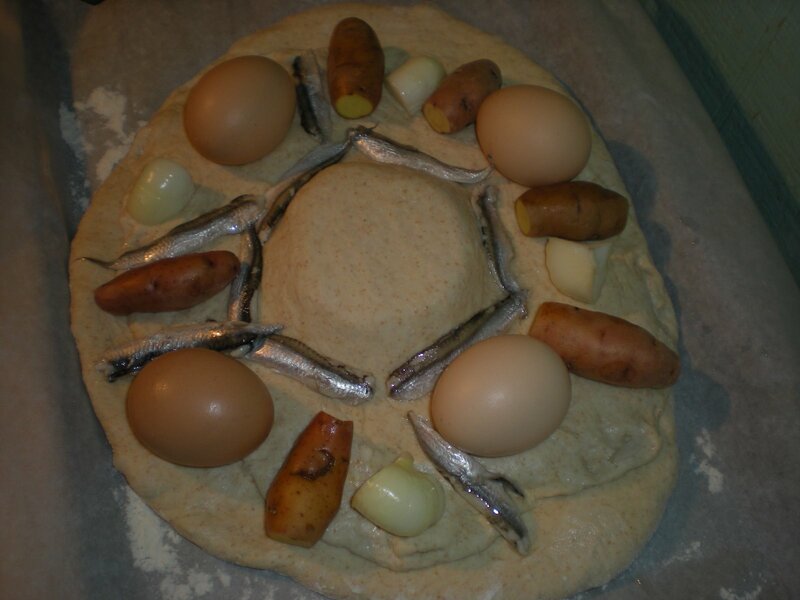 Autolyse for 30 minutes (autolyse means just to let it rest for a bit to give the flour time to absorb the water). Now add the Final Dough salt and yeast. 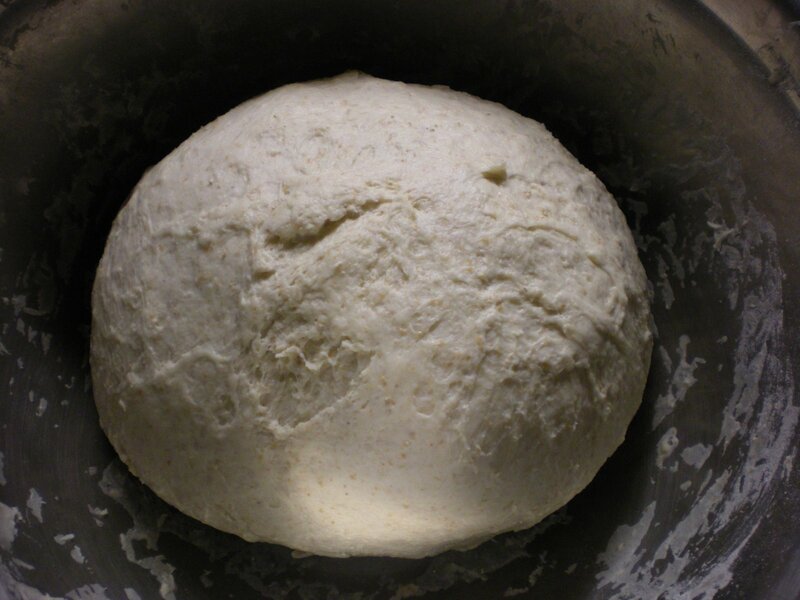 Knead for a few minutes more and then transfer to an oiled bowl and let rise for 1.5 hours, folding it once at 45 minutes. 5 pearl or other small onions. 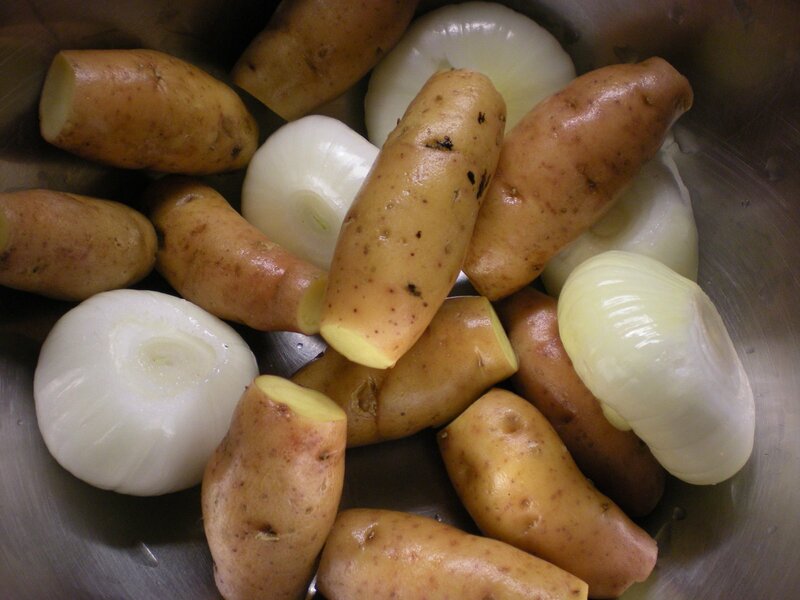 I used golden onions. 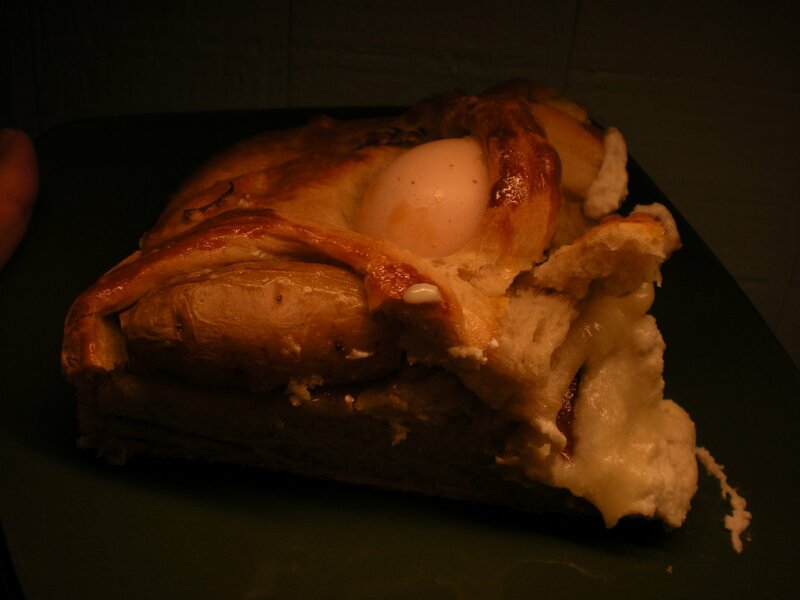 Also, set out about 8-10oz of soft sheep’s or goat’s milk cheese and four eggs. Preheat the oven to 400 degrees. 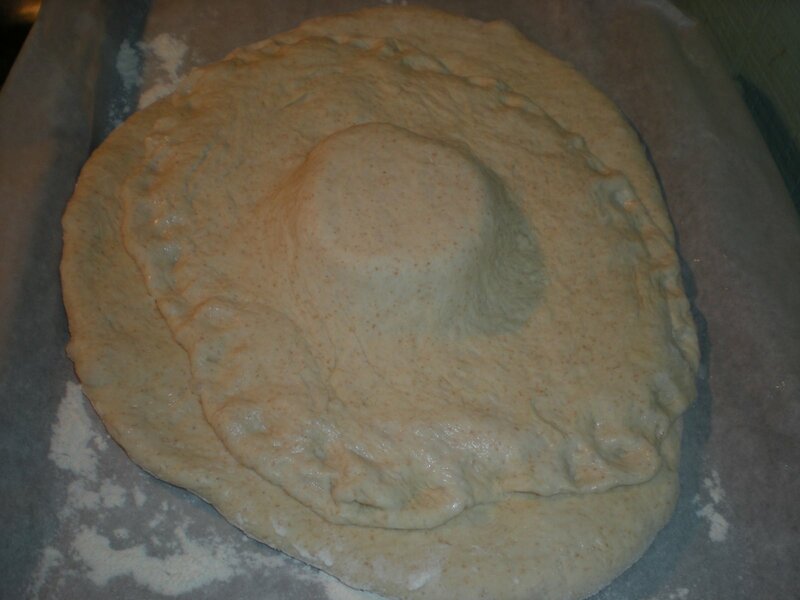 When the dough is fully risen, divide it into two pieces. Set one piece aside. With the other piece, roll it out to about 1/2 inch thickness. Transfer it to a cookie pan lined with parchment paper and sprinkled with flour. Set the cheese in the middle. With the piece you set aside, divide that in half and set one piece aside. 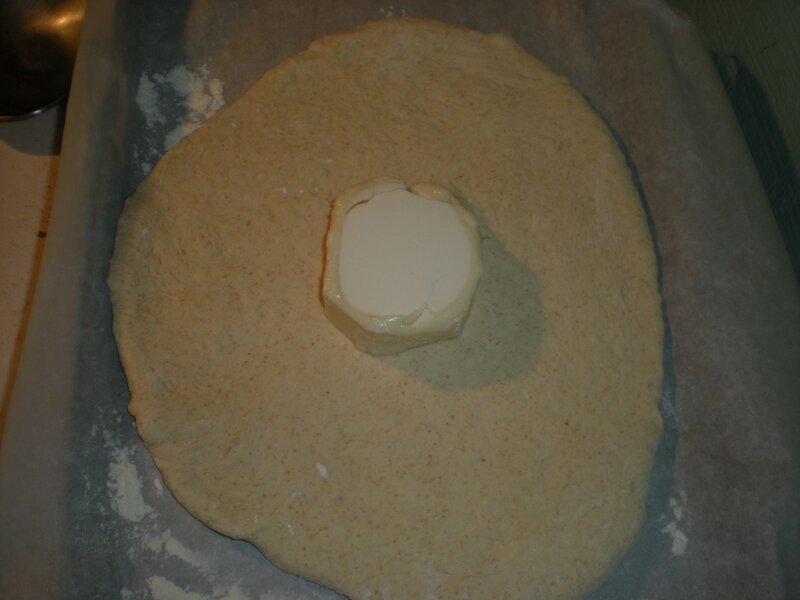 With the other piece, roll out the dough into a circle slightly smaller than the first one. Use this piece to cover the cheese and use a little bit of water to seal the edges. Now comes the fun part! Decorating! 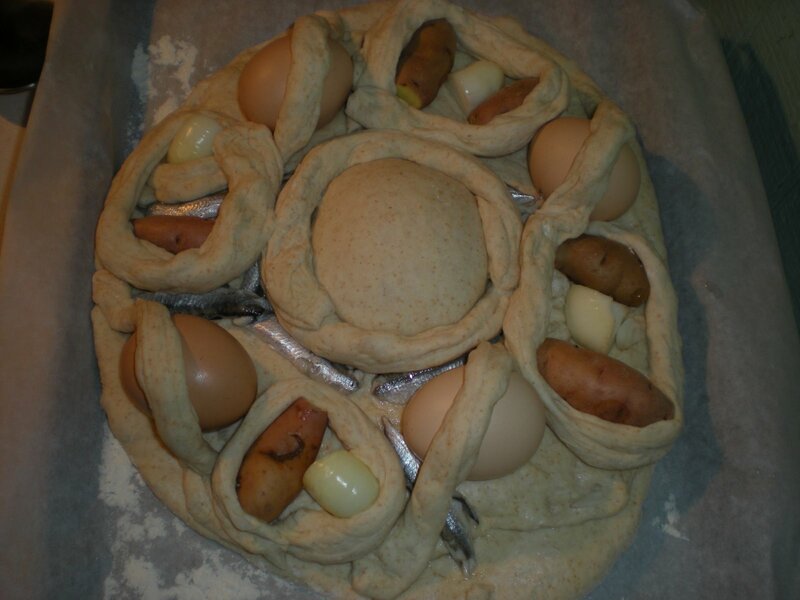 Take your eggs and poke a small hole with a needle or pin in each end. Supposedly this is to keep it from cracking but mine cracked anyway. Take the final piece of dough and cut it into long strips. Use these strips to surround some of the pieces in a decorative way. Now slop the whole thing with the egg yolk. Bake for 25 minutes at 400 and then turn it down to 350 and bake another 25 minutes. Make sure it cools before cutting into it. So how does it taste? The bread itself is pretty basic (maybe next time I’ll use a starter to make the flavor more complex). But I loved the flavor of the anchovies and the cheese together that soak into the bread. The onions were nice and sweet. The potatoes were, eh, I dunno. They were ok. Needed salt. 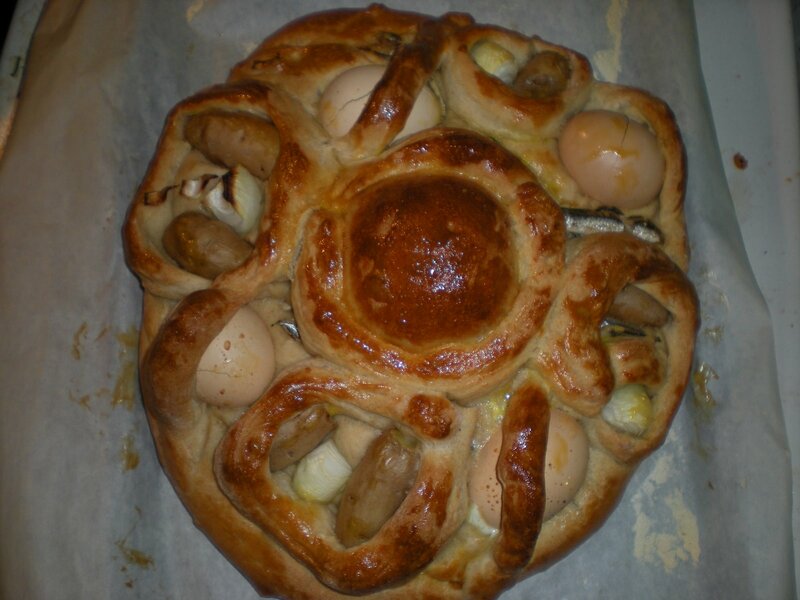 That’s one of the problems of this bread- the eggs and potatoes are cooked raw, and the egg is in the shell, so it doesn’t impart any flavor or take flavor from the other ingredients. The verdict? Mr. 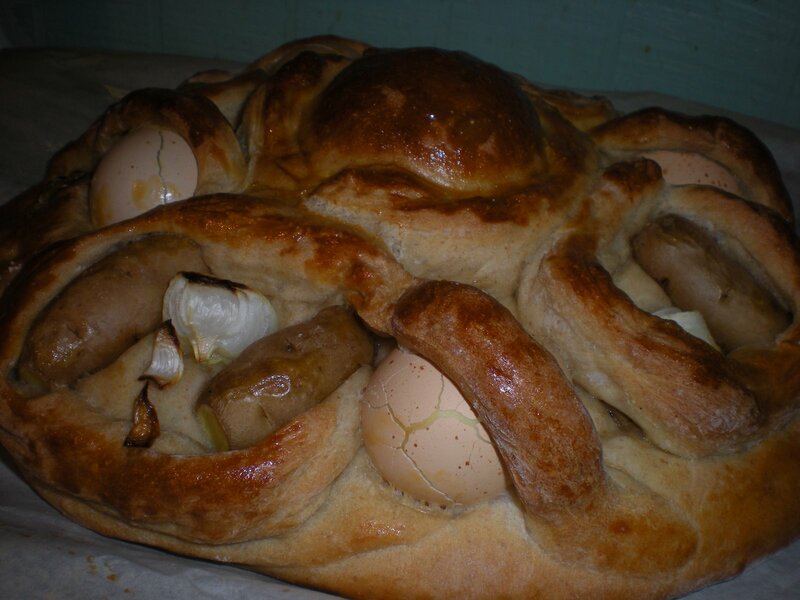 Bread Maiden wants to try the recipe again with bleu cheese, sausage, and the onions. Stay tuned. Whoa! Blue cheese and sausage! That would be AWESOME! A most festive bread!! Your anchovies… where did you get whole ones? The onions were beautiful and I’m sure they added good flavor. 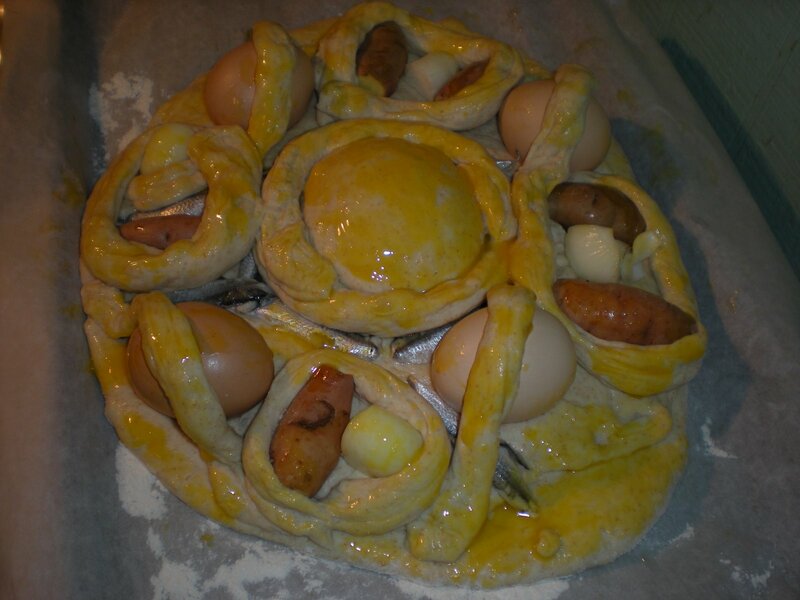 You commented that eggs and potatoes really didn’t add another dimension, although they added eye candy! Very nice!